I would like to invite you to join us at Tannehill Ironworks Historical State Park for our annual Civil War Living History event on Thursday, April 7. Come see historical re-enactors in period costume demonstrate Civil War artillery, cavalry, and infantry, as well as camp life, music, toys and games, flags, and much more. Students can even participate in a military drill! The program runs from morning through early afternoon and includes a lunch break. 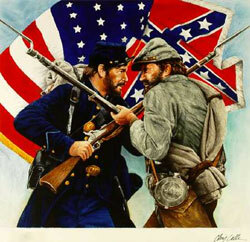 Civil War Living History is open to homeschool groups and individual families. Preregistration is required. The program fee is $6 per person and must be paid upon registration to reserve your space. There is no cost for children under 4 years old. For more information or to register for the program email me at Tannehillmuseum@bellsouth.net or give me a call at 205-477-5711 ext. 15. Thanks, and we hope to see you in April!